Everybody needs protein. der. klang. If you’ve read our post on the linear sampling app – SAMPLR – and very very good it is too – and have got to grips with it, you’ll understand that it’s intuitive, fast, easy to use and highly versatile as a performance sampling instrument. Yes. But what if you want to sequence multiple samples together in a matrix? We’ve been using SAMPLR to great effect in live performance and the only limitation we’ve encountered is the continuous nature of the “playhead”. But what does that mean? What that means is triggering freshly loaded samples in sequence is difficult. Where SAMPLR works more like an instrument Protein brings sequencing to the equation. Der Klang offers a 12 sample matrix, as you can see in the picture above, AND, the ability, on touch, to trigger each / any sample with BPM sync’d triggering. And it has Audio input. Fresh. 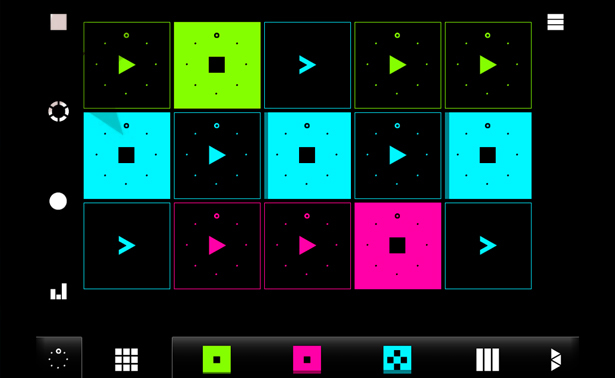 Audiobus compatibility is also native. The interface is unusual at first, and there is an inevitable learning curve – but after an hour we had our sounds – 16 BIT WAVS only – ‘in the box’ and it performed well in live performance. The only downside we can report right now is no MIDI support and the interface is “mystical” – it’s so far off the skeuomorphic curve with regards to audio interface motifs – but those prepared to persevere might find it rewarding.